Fantastic tea and where to find it. SmSh takes you through the markets and shops of China's largest tea distribution center. Spring is the best time for green tea. During early springtime, tea leaves picked before the Qingming Festival (ming qian cha, 明前茶) and from April 5 to April 20 (yu qian cha, 雨前茶) are highly praised by tea lovers. Much like wine, however, the sheer amount of variety, regional strains, and pricing of Chinese tea can be overwhelming to newbies. And there are so many places to find tea: tea markets, tea houses, scattered tea shops along the streets, in the shopping malls and supermarkets -- even more so in Shanghai, the largest tea distribution center in China, and a city where you can find pretty much all the top notch stuff. After speaking to a few certified tea nerds we've compiled this list of tea shops that stand out among the many. Here's a look at the main Tea City retail market, the scattered recommended shops around the city, great tea hangouts, and your options for online shopping. "Tea Cities" are large tea markets comprised of hundreds of retailers. They're great for finding extremely fine tea and also great for getting ripped-off. If you've got time to bargain, shop around in different stalls, and are fairly confident in your tea knowledge, a Tea City is the ideal destination. Tianshan Tea City (天山茶城) has been around since 2002, and according to the Shanghai Tea Trade Association, the market accounts for around 40% of tea sales in Shanghai. Located right across the street from Shanghai International Gymnastic Center, it's surrounded by all kinds of trinkets stores, and a fruit market that sells avocados for 5rmb. 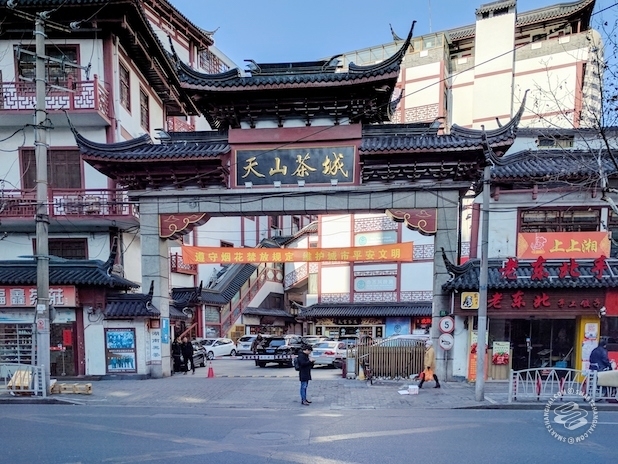 This three-storey complex houses hundreds of retailers: the ground floor and the second floor are mainly for tea, and the third floor is mostly teaware, pottery art, and curios. It might look tacky and messy on the outside but when that pleasant tea aroma hits you the moment you walk in, you'll know you’re likely to spend a whole afternoon here. On sale, you've got everything from old school tea bricks to trendy Xiao Guan Tea(小罐茶); Tibetan handicrafts to Japanese tetsubin. Quite a few of the picturesque stores look like they belong in another time and place. Contrary to many retail markets in Shanghai, sellers here rarely approach you, but that doesn’t mean they’re not friendly. Plenty of shops offer multilingual, informative services, and you’re always welcomed to try before you purchase. Bear in mind, the most knowledgeable and profitable tea dealers tend to be the ones who know how to read customers. To put it simply, the best and worst value of products are often from the same stall. “It’s a very complicated business,” as my tea nerd friends would say. Note: "Time-honored Brands": These can be found in commercial areas or major shopping malls in most of Shanghai’s districts, sometimes at the airports. These are good for quick gift shopping. The two brands I’ve listed here both have very good reputation in terms of quality control. “茶庄”(chazhuang) more or less caters to the tastes of Shanghai's working class. Like many tenants on Huaihai Zhong Lu, Xuyou also has a long history. Established in 1951, it's a state-owned brand, trusted by local Shanghainese. 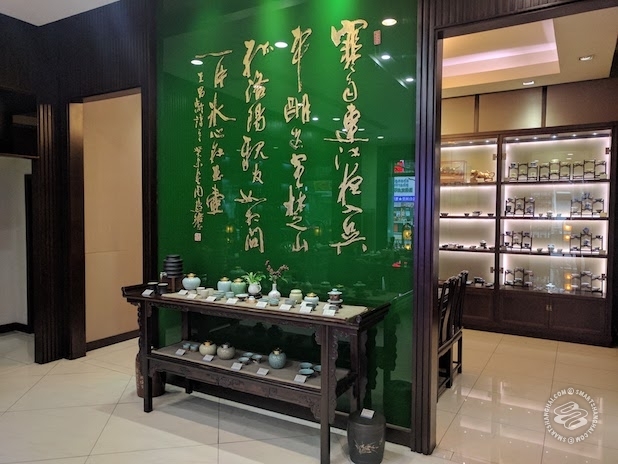 This shop is slightly fancier than other chains, featuring a nice display of tea products, tea sets, and Yixing teapots ranging from a few thousand to tens of thousands kuai in price. They stock over a hundred of tea varieties, albeit only a selected few can be sampled. The indoor smoking ban seems overlooked by the staff so far, and it’s not particularly quiet, either, which might be a turn-off for some people. But it most certainly feels like a typical Shanghainese tea shop. 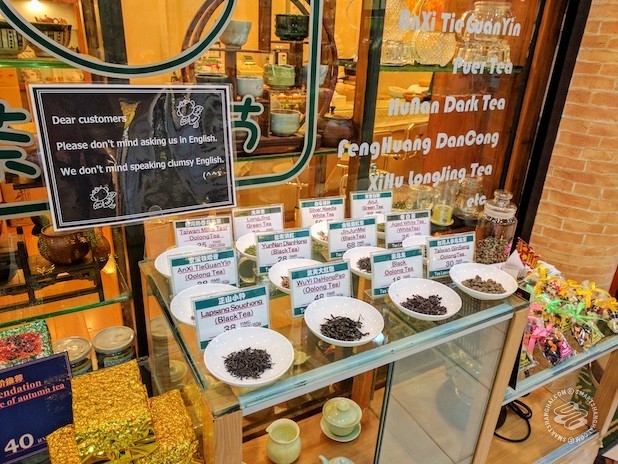 Popular tea varieties such as tieguanyin, pu-erh, phoenix dan cong, and keemun are sold from 10rmb/50g to 680rmb/50g or more. 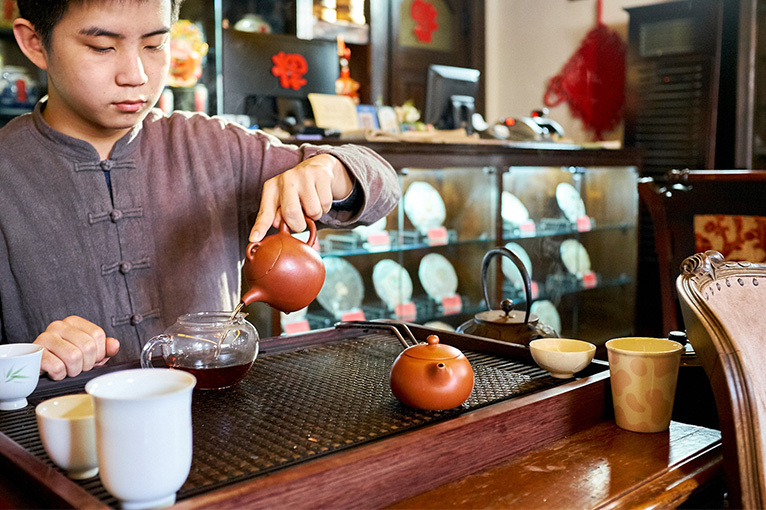 A Taiwanese import, Wang De Chuan has been making tea since 1862, but their fifth-generation descendants have been keeping up with current trends, positioning the enterprise as the tea equivalent of Starbucks. They do quality tea with elegant packaging, and also cater to those who want a quick tea to go. Wang De Chuan entered Shanghai market in 2011, mainly opening in places where people dress well. They specialize in premium quality oolong from Taiwan and pu-erh from Yunnan. 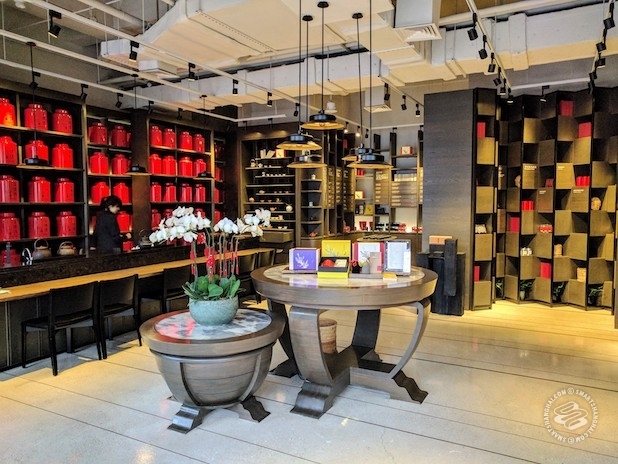 To promote tea culture, they’ve also partnered with Louis Vuitton and a couple of local movie blockbusters in recent years. They're pretty busy. 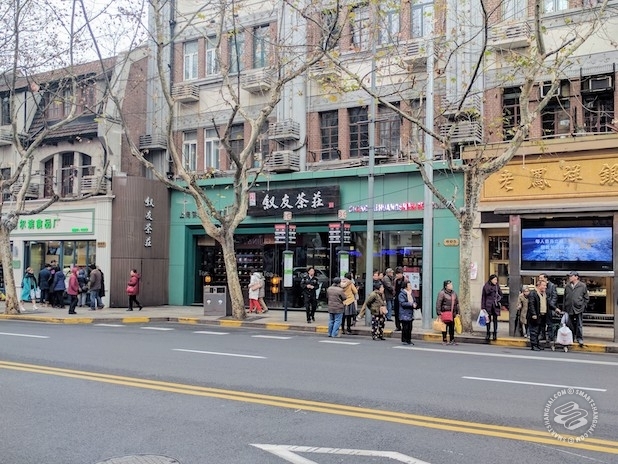 The Xintiandi branch sits right next to a Starbucks, hidden in plain sight, and seems... way less busy. 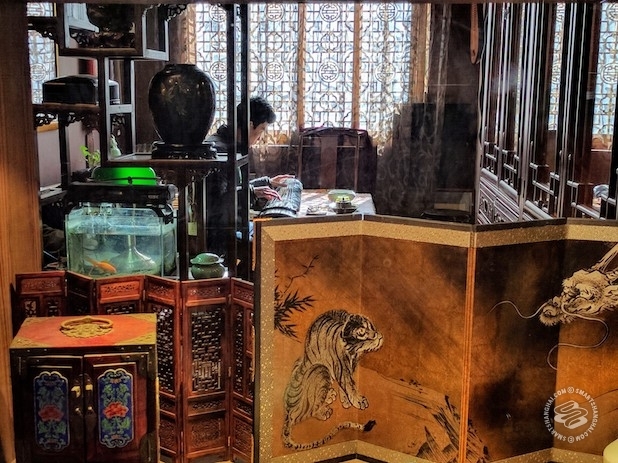 This shop is divided into two main areas: one for tea display, another is a meeting room with the capacity of six to eight people, which costs 100rmb/ hour to rent -- plus a tea fee from 60rmb to 150rmb. Their signature red tea cans can be seen everywhere in the shop. 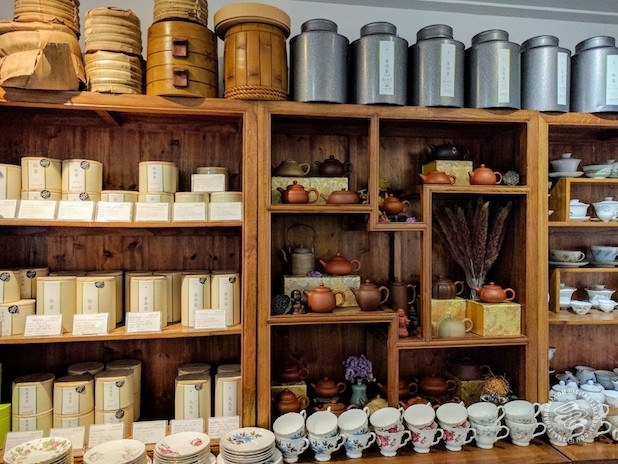 On the dark wooden shelves, aged raw pu-erh, ripe pu-erh and various types of Taiwan oolong are labeled clearly in both English and Chinese, along with information pertaining to their origins and craft. Service is really attentive, you can sample as much as you want, and they offer tea courses for 180rmb/ hour (available in English). 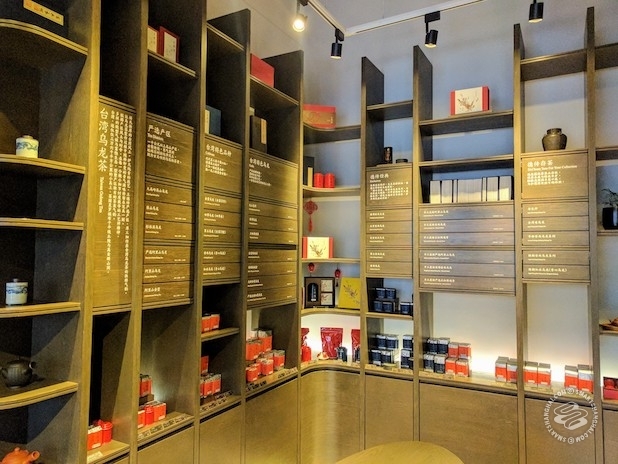 For a flagship store, the pricing is not outrageous -- Wang De Chuan’s classic Anshang Oolong, for example, is sold from 68rmb/ 70g to over 600rmb/ 70g. The consensus among tea experts is their low- to mid-ranged tea often has better value. Other Wang De Chuan chains are listed here. Small, cozy, and quiet, and great for people looking for unique stuff with time to sit down, sip tea, and enjoy a nice chat with knowledgeable owners and shop assistants. Independent shops are great for honest prices too. A lot of them rely on positive word-of-mouth for their businesses, and many don't even seem to care if you buy anything -- just that you leave with a good impression. A traditional style tea shop that opened in 2012. The word “敲冰” ("break the ice") is a reference dating back to Tang Dynasty. When hermit Wang Xiu greeted his guests during winter, he would use the ice from the stream to make the fine tea. 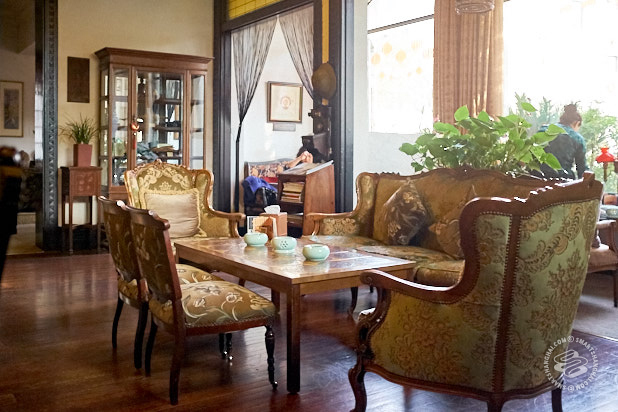 The shop evokes the same friendliness and has been a regular meetup spot among expat tea enthusiasts for the last several years. All six types of Chinese tea are stocked, along with imported tea from Hong Kong and matcha from Japan. Owner Miss Li has partnered with a few tea manufacturers in China and abroad, even picking the tea leaves herself in Henan with local farmers. These teas are packaged in traditional handmade and eco-friendly packaging; they're carefully folded and sealed with rice paste instead of glue. You are very likely to find some exclusive, unique tea with interesting backstories here. 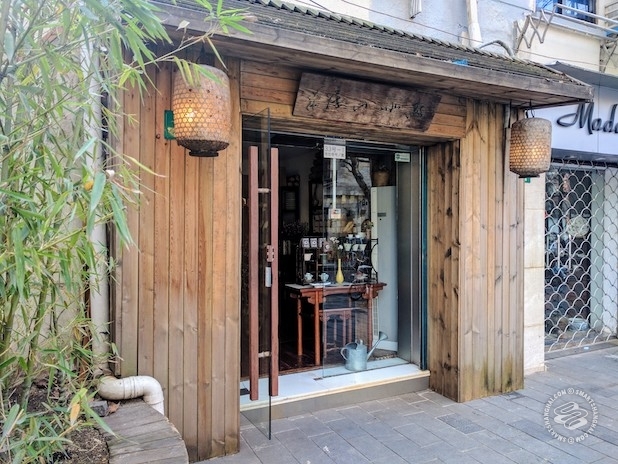 In addition to that, they also offer a variety of handmade antique teaware, customized tea products, and Cha Dao (tea ceremony) lessons. 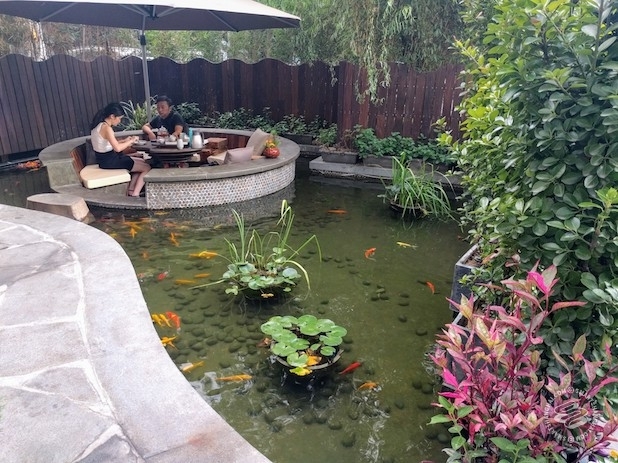 For teas less than five years old, customers can sit and enjoy for 50rmb/person, with no time limit. Cha Dao is 3,000rmb for nine courses, 3 hours per course. 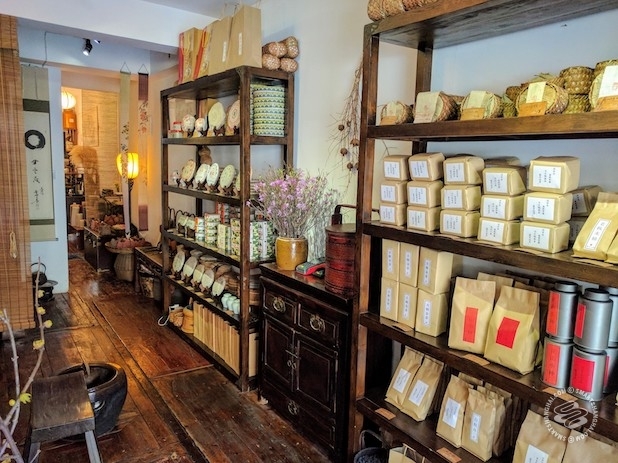 Well-known among expats, and featured frequently on English tea forums, this little, quiet two-storey shop is opened by a lady called Wanling from Fujian province, recognized as a home of high-quality artisan teas. Quite a few of their products are labeled with the coveted ‘Great Taste Award’. Customers are welcomed to make their own blended tea, and have a taste of whichever tea they’re interested in. The majority of their teas are popular choices like tieguanyin, jasmine tea and chai, priced at 50ish rmb/ 56g to a few hundred kuai. Different sizes of Yixing teapots are also available, all hand-made by one artisan, and affixed with 1,900rmb to 8,700rmb price tags. They also sell British royal bone China tea sets from 380rmb to 580rmb. You can find more information about their sourcing here. Both downstairs and upstairs have rooms to sit down in. To try two types of tea with a friend, along with little snacks, costs around 200rmb. Ideal for those who are looking for a more homey environment. 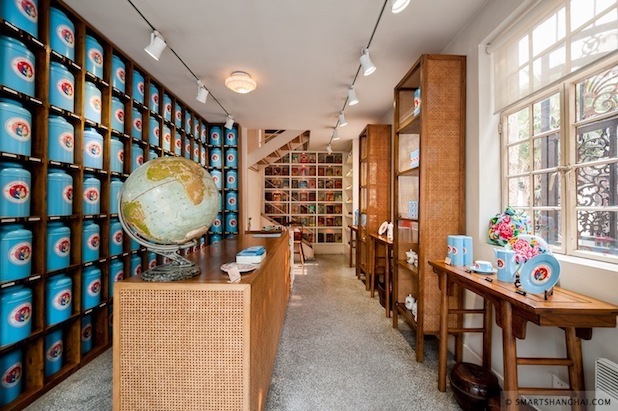 Wanling tea house has also expanded their business to UK, Australia, and other parts of the world. A major part of the Chinese tea drinking culture is to enjoy it with friends. 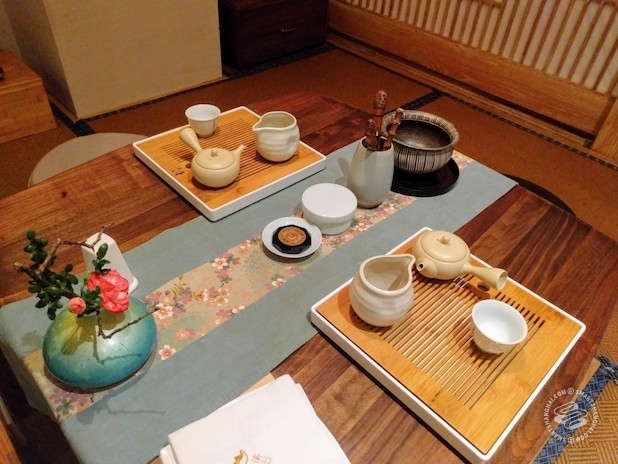 Since ancient times, the process of making and enjoying tea (the "tea ceremony", Cha Dao, or Cha Yi) has always been more of a relaxed and simple activity for Chinese, rather than as a product of a Hierarchical system like it is in Japan. What follows are places know for their spacious rooms, snacks, and music. This place is a must-go if you’re looking for a more international taste of, say... a boutique shop. 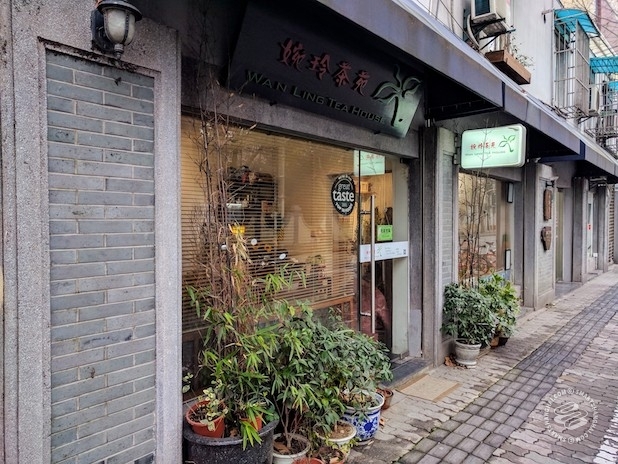 Song Fang Maison de The is a quaint three-storey lane house located on the quiet side of Yongjia Lu, opened about a decade ago by a French expat. The first floor is dedicated to popular tea varieties such as tieguanyin, oolong, pu-erh, and blended teas from France. They sell tea sets as well, with their signature blue and red tea tins neatly arranged in the background, along with collections of vintage decorations. On the second and third floors, both cozy and bright spaces, they provide an extensive tea menu (caffeine-free varieties included), a handful of homemade pastries, and free wi-fi -- an ideal place to hang out with a friend or do some light work. Pricing is slightly above average. On our visit, their green tea started from 80rmb/ 50g to 490rmb/ 50g. If you want to sit down and have something on the menu, average per person is around 50rmb to 138rmb. Only bills over 200rmb can be paid by cards. Song Fang Maison de The also has a smaller chain that only sells tea on the Bund. This one is for pu-erh lovers -- like Song Fang Mainson de The, Da Ke Tang (Xiangyang Nan Lu) also occupies a classic colonial building built in the 1930s. An old French-style official mansion, it's rather magnificent-looking, sort of hidden, and solemn. A wall of photos are on display at the entrance: TV presenters, movie stars, and politicians -- it’s a well-known spot among the wealthier, more mature local crowd. Considering the type of tea they’re selling, it makes sense. Guests are welcome to take a look around. 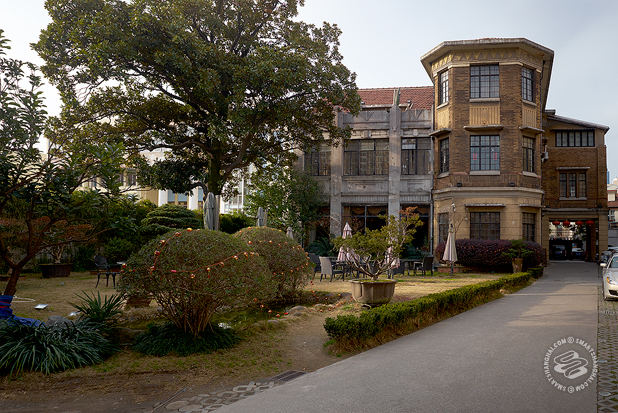 Aside from a private garden in the front, the building has two main halls, one tea shop, and around 17 private tea rooms, each named after a mountain from Yunnan -- home of pu-erh. They also have a more secluded 2½ floor, where the old Shanghai vibe is even stronger. They stock several pu-erh varieties, listed in an old, thick booklet. They've got “almost every kind you can find in Yunnan” I was told, “and all of them (on the booklet) are available”. Pretty amazing, considering they have listings for teas that are centuries old and cost in the millions of RMB. The minimum cost is around 150rmb/ person in the main halls. Prices go up depend on the type of private room. Worth a visit, even just for the building itself. 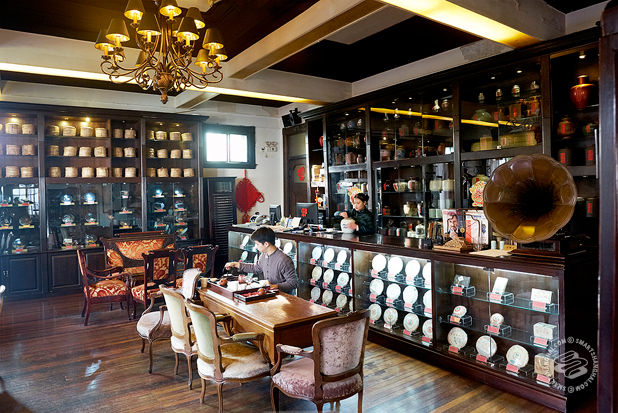 The last few years Shanghai has seen the emergence of modern tea houses. 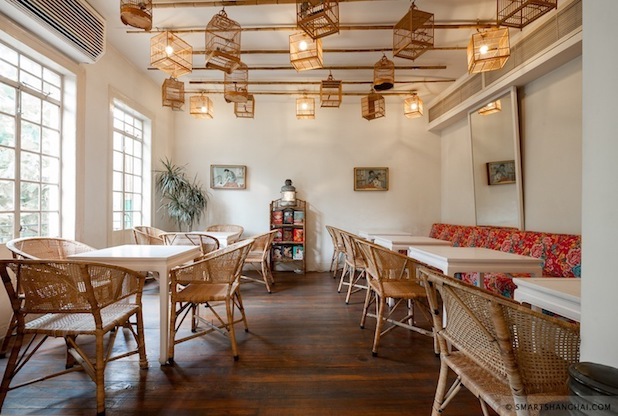 A hybrid of the traditional tea house and neo-Chinese aesthetic -- or should I say “Instagram-friendly” aesthetic? Concept-wise, they resemble cafes, serving not just tea, but snacks, and even noodles for you to enjoy with your brew. Kind of like the Mid-Lake Pavilion Teahouse (湖心亭茶楼) in Yuyuan made for younger generations. You don’t come here for mind-blowing tea, but some quality time with friends or business partners. Zenjoy is a good representative of these types of hangouts. Very quiet and comfy environment, friendly and soft-spoken staff. The outdoor round tables in the middle of their ponds are super nice spots to sit down, on a rainy day it even feels more poetic. Although the tea quality might not be the main focus here, you do get decent variety and plenty of choices. Every room is equipped with induction cooker, proper tea sets, and they can help make the tea if you want. Groupon packages for two, three, five and more people are available on Dianping for 169rmb, 258rmb and 398rmb accordingly, almost one-third of the original prices. However, groupon users have to finish their tea before 1pm, or enter after 7pm. Simple snacks, pastries, and dishes are also available. Supermarket shelves aren’t really a great place to properly store tea, and tea companies have to achieve high-profit margin in order to secure a spot in their aisles. You’ll notice a lot of the tea come with inflated packaging, a vague “tea leaves” (茶叶) on the ingredient list, and a confusing manufacture date -- usually it refers to the date it’s packed, instead of the date it’s manufactured. You wouldn’t want to use this stuff even for making tea eggs. Imported supermarkets like City’ Super or Ole' are a better bet but expect to pay way more than you should be. The main key to finding good tea -- or, the tea that you like, to be precise -- is to be able to observe, smell, and taste it. You certainly cannot have that experience while shopping online, at least for now. Unless you’ve already tried the tea at an offline store, it’s not really a good idea to buy it online just because it’s cheaper. Remember: “It’s a very complicated business”. Major types of tea like tieguanyin, dahongpao, and longjing all come with a “national standard code” (国家标准号), like GB/T 19598-2006 (tieguanyin), GB/T 18745-2006 (dahongpao) and GB/T 18650 - 2008 (longjing), so if you really need to purchase tea online without trying it first, find a store that provides adequate information about their tea: the national standard code, which season the tea was picked, blended or not, a precise location of the tea farm and so on, as detailed as possible. Special thanks to Mr. Lu, founder of ten-year-old online tea shop/ distributor Chass (茶也), whose insight on tea I shamelessly stole from.